This article has been published in Nature Geoscience, 2011 . 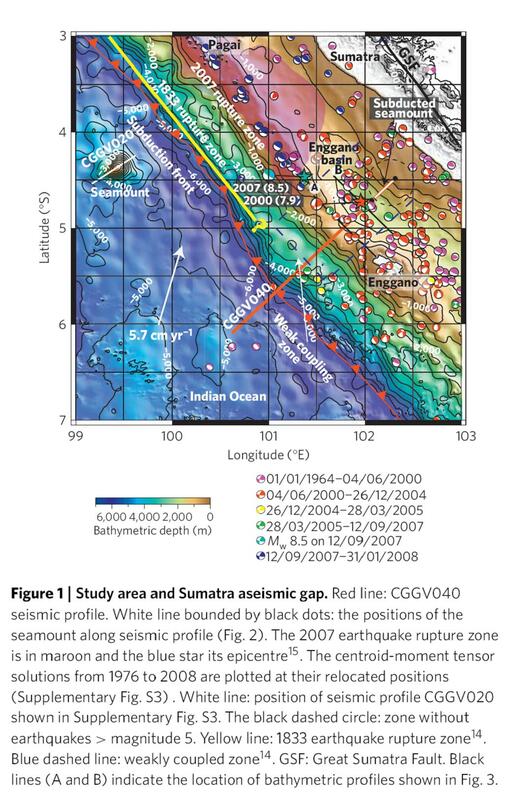 The authors have identified a seamount 3–4 km high and 40 km wide that has been subducted to a depth of 30–40 km below the Sumatra forearc mantle. The seamount has remained intact despite more than 160 km of subduction, and that there is no seismic activity either above or below the seamount. The authors suggest that the subduction of a topographic feature such as a seamount could lead to the segmentation of the subduction zone. Tagged accretionary wedge, aseismic, deformation, earthquake, forearc, ma'ruf mukti, megathrust, seamount, segmentation, subduction, sumatra, tectonics of indonesia.